This lamp features a 40mm diameter which is the most popular size in the festoon range and is available in a range of LED light source colours and has an opal cover. The Limelight range of LED festoon lamps offer a great range of colours, functions and styles to compliment, enhance and outline tree branches, building facades, Hotel garden bars, shop frontages, etc. The standard product range comes with some variations in terms of function, but with enough lead time Limelight can absolutely customise your order to provide you with a totally unique product. The standard product range comprises of a 40mm sphere in clear or opal / 1.5 watt LED in warm white / cool white / red / green / blue / constant colour LEDs. An auto RGB version is also available which provides a dazzling array of colours cross fading in an “out of sync” formation. No control is required for this option as the product operates on an auto colour change function. In terms of customization the product range may be changed to suit your requirements. A larger 70 – 80mm clear or opaque sphere is a “larger than life” option as the festoon lamps resemble illuminated fruit hanging from trees. 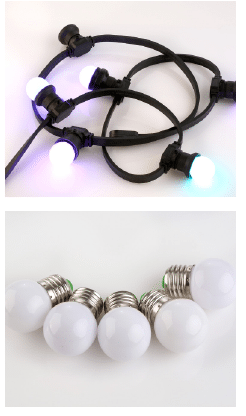 The festoon cable may be customised also to suit your specification. Normally supplied in a 50 metre roll at 300mm spacing. The spacing may be adjusted to any spacing you require. The Limelight festoon lighting product range is capable of transforming your lighting project into a beautiful illuminated space with a product range to satisfy all visual requirements from the casual elegance of a hotel poolside bar, a local council main street to the magic of a row of colour changing trees in a children’s playground. The Limelight festoon LED lighting range is a long-lasting quality product that will provide an element of beauty and long-lasting reliability to your lighting project. Matching Festoon cable loom available. Cable loom lamp-holder spacing can be customised. Mains voltage 100-240VAC version available by special request. RGB colour-changing enabled version available.